The Kingspan Kooltherm line offers an extensive range of products for wall, floor, soffit and rainscreen applications. It has a fiber-free rigid thermoset phenolic insulation core that resists both moisture and water vapor ingress, and exhibits class-leading fire performance. 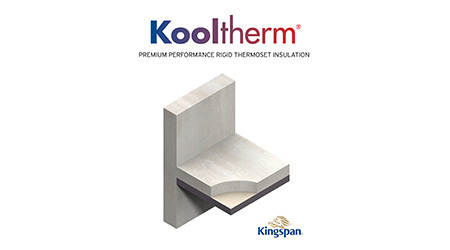 With an R-value of 16 on two inches, Kooltherm has a higher R-value than any commonly used insulation. It is manufactured with a blowing agent that has zero Ozone Depletion Potential (ODP) and low Global Warming Potential (GWP). Available as a cavity board, soffit board, framing board, and rainscreen board.